Working on my December Daily album. I have the title page and a journaling insert to complete and then it will be finished. Finished! Watching Gossip Girl. Or rather, binge watching with Netflix. Donating to the Red Cross Nepal Region Earthquake Appeal. It was almost this time last year that Mike was in Nepal, hiking to Everest Base Camp. I just can't imagine. Intending to participate in Day in the Life on Tuesday 12th of May. Receiving my latest Story Kit from Ali Edwards. Planning on making Mothers Day cards together with Mike next week. The photo booth was one of the first things I booked for our wedding and was a surprise to all but a few of our guests.It did cause me some worrying - is there enough room? will people use the photo booth? - but on the night it was very worth it. The booth seemed to always be busy, people had a blast and we ended up with some great shots. To share the photos of revelry, we decided to make some photo books as gifts. There were a few different versions - my family, his family, etc - which was easy enough to accomplish with the Artifact Uprising software/interface. I included a title and date on the first page and repeated some of my favourite photos as enlargements throughout. Love these little books! Great memories. Simple Scrapper: Up. Down. Around. When I saw the April sketch templates collection from Simple Scrapper, I knew this sketch would be perfect for a layout about riding rollercoasters and thrill rides. I choose a selfie taken on a Disney World rollercoaster as the main photo, with supporting photos taken both at Disney World, Movie World and Sea World in Australia. Then I printed them all too big. I knew I wanted to use letter stickers in different colours, so to keep the layout from going too crazy I chose a white cardstock background with multicoloured patterned paper to frame. I arranged the photos but adhered many of the letter stickers/words first, finessing the photo locations to suit. After adding a little loop-da-loop in my sewing border, I decided to do the same in my journaling. I made sure to give myself enough space, filling in the gaps and attaching the bordering strip only after the journaling was written out in pen. I swapped out a strip of paper for a row of stamping, to add a different texture. Some favoured enamel dots and wood veneer as finishing touches, and the layout was complete. Today Mike and I made the first booking for our next holiday. After months of debating, umming and ahhing over whether to go away or not, we are now in the sweet spot of holiday planning; a trip is definitely going to happen but we haven't yet had to organise all the other pesky details. Flights, accommodation, transfers, car rental, visas, local currency, house sitter, time off work, budgeting...it's no wonder planning isn't my favourite part of travel. At the moment our trip - a few weeks in Italy and Croatia - is all possibility. With every decision we make we will narrow down the options, choosing this location over that one, a few extra days here in favour of there, this hotel over that one, second guessing yourself all the while. But this right here, a trip on the horizon and nothing but possibilities, this is the sweet spot. Yesterday Mike and I met up with some friends visiting from Canada and took them to Healesville Sanctuary. I met the couple in India back in 2008 - we were on the same tour - and they've since married and had two adorable little boys. It was lovely to catch up and spend the day with them, showing off some of our crazy/wonderful Australian native animals in the process. I made the place cards for our wedding reception using my Silhouette and a variety of symbols that represented something about Mike and I. There was a tent with campfire, a camera, globe, plane, scissors and a 4 wheel drive. Apparently they were quite the topic of conversation when people were shown into the dining room, comparing their symbols. These place cards were a little fiddly and there may have been some muttering by the time I was finished all 60 or so, but I love how they turned out. After a long, last day at Disneyworld Mike and I sat down at table of the restaurant/bar at our hotel, New Orleans Resort French Quarter, to have a late dinner. When one of the ladies on the next table spilled a drink on herself, much to her disgust and the amusement of her friends, we were pulled into conversation. These four ladies were nuns, based in different orders around the country now but together again to celebrate, belatedly, a 60th birthday at Disneyworld. Nuns at Disneyworld; it blew my mind in the best possible way. We talked about Australia's recent military involvement around the world and the role of religion in American politics, the decline of religiousness in Australian society and the impact that has on developing communities, and Mike was quite open about being an atheist. I was a bit apprehensive about that - who tells a nun they're atheist!? - but he was respectful and they were fascinated. They had never met an atheist before and wondered how we could still be such good moral people. Chairs all pulled together, we had one of those great conversations that make you sad when it's time to say goodbye. And when we eventually did, they offered us a blessing before remembering Mike's beliefs and repeating the sentiment in secular language. I can be somewhat cynical when traveling, often treating a greeting from a local with caution and a check of my pockets and bags. But while that reaction does have a place, genuine interactions with locals have resulted in some lovely travel memories. From the Egyptian toilet attendant who put a cold compress on my forehead when I had heatstroke to the Japanese gentlemen who all but grabbed my camera and hustled us into a better position for a photo to four American nuns at Disneyworld, sharing kindness and conversation can be wonderful. When I read the Simple Scrapper Story Starter theme for April, belief & faith, I wasn't particularly enthused. I didn't think I had anything to document but, after some prompting from Mike, I'm really pleased to have recorded my thoughts on a topic that's important to me right now. 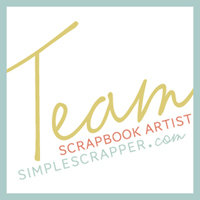 Religion and belief is this month’s theme at Simple Scrapper and I pondered to Mike, what on earth can I scrap about. I’m not religious, but not atheist, really I’m just not fussed. Write about feminism he suggested, you care about that. I’m not surprised he thought of it. We’ve had long discussions on the topic, with me ranting and raving only occasionally. I was so frustrated when Mike wouldn’t agree he was a feminist, before I realised something: feminism has an image problem. Mike is a feminist, he just doesn’t identify as one. I believe men and women deserve equal rights and equal opportunities. That’s feminism. Just that. Not man-hating or misandry. I don’t think women are better than men. Feminism seeks equality, because we’re sure not there yet. There is an advertisement I watched recently, a video of people acting out how to do things ‘like a girl’. The younger girls just run and throw, trying their hardest, but the older girls (and boys) give this mocking interpretation of girls running, throwing, fighting. As a society, what are we teaching our girls to change their thinking like that? Doing something ‘like a girl’ should never be an insult. Girls are awesome. I believe we raise females differently to males. And somewhere along the way we are doing them a disservice. I believe women often undervalue themselves and we can be our own harshest critics. We’re less likely to speak up, to trust our own judgement, to rebound from criticism. Even the language we use as females is more likely to be tentative with qualifiers like ‘I believe’, making us seem less authoritative, more unsure. We are slowly overcoming cultural gender roles, but we have a long way to go. A father does not ‘baby-sit’ their own child, they’re just fulfilling a basic parental responsibility. That irks me so much, I will actually correct someone if I hear it said. Childcare costs should be calculated against family earnings, not the mother’s alone. And let’s not forget to include potential future earnings as well. I don’t think there is an easy solution to pay inequality, nor the underrepresentation of women in high powered roles. Sexual discrimination is already illegal, arbitrary quotas are not the way to go. But we discuss and debate. We talk about why women overuse the word sorry, how domestic violence is never ok. We learn and inform. And slowly there is change. I’m a feminist. And there’s nothing wrong with that. I wasn't sure what photo to chose for this layout, so I decided on none. Originally intended as an 8.5 x 11 size, I added it to a 12 x 12 background to allow more colour/breathing room. If I was to make this layout again, I'd put a different colour/pattern paper behind the title to add interest. I'll admit it isn't a particularly engaging layout, but I'm pleased to add this belief to my album. Feeling sick. I'm much better than a few days ago, but I'm still coughing and spluttering away with a rotten cold. Carrying a hankie with me everywhere. Thinking I've made a habit of getting hide-under-the-covers sick when my boss is away, making sick leave a whole lot more problematic. Eating homemade chicken soup, dropped over by Mum Tuesday evening. There's beef casserole in the fridge too. Drinking hot tea made for me by Mike. I think I'll be making some for him in return, as now he's getting sick too. Wearing scarves and slippers and snuggling under rugs on the couch. Reading the Jane True series by Nicole Peeler . Photos: with my favourite 2 year old princess at Easter. Celebrating Mike's birthday with High Tea at The Langham, then drinks together on a beautiful city evening. There was also a dinner with friends and dumplings with his family. I made him what might just be the ugliest card I've ever made but the strawberry and hazelnut meal cupcakes were yummy. And my (main) present for him was a week late. Oops! Two great weekends away; camping at Wilsons Prom and the Alpine Mini Tour. Our second time going climbing in about 6 months. We haven't yet reestablished our routine post honeymoon and I climbed atrociously. But, after 6 months I'm declaring just trying a victory. Contributed to a Studio Calico workshop, making a Project Life spread with memorabilia from our trip to Japan. I also cancelled my Studio Calico subscription as they Project Life kits are piling up way faster than I can use them. Managing to catch the wrong train home from work, taking the wrong train line, and needed to call Mike to come pick me up from a few suburbs over. Attended a Melbourne Food and Wine Festival event, A Global Gathering, with friends, eating our way down Bridge Street Richmond. Receiving an invitation to holiday with friends in Vegas, in 2023. That's some early 40th birthday planning! Thinking about installing a wood heater for that lovely cracking atmosphere. Bought two new pairs on pants, the same style in black and navy. Given I often don't realise which colour I chose to wear till halfway through the day, I really didn't need to get both, but they're SO comfy. Easter weekend and 4 days straight off work. Can't wait! Seeing a performance of Lion King with Mum and Jenna. Finishing the last couple of thank you notes remaining. The start of football season.